Doctor Strange: Damnation – The Complete Collection Review – AiPT! Doctor Strange vs. Mephisto for the fate of the world. Is Damnation good? 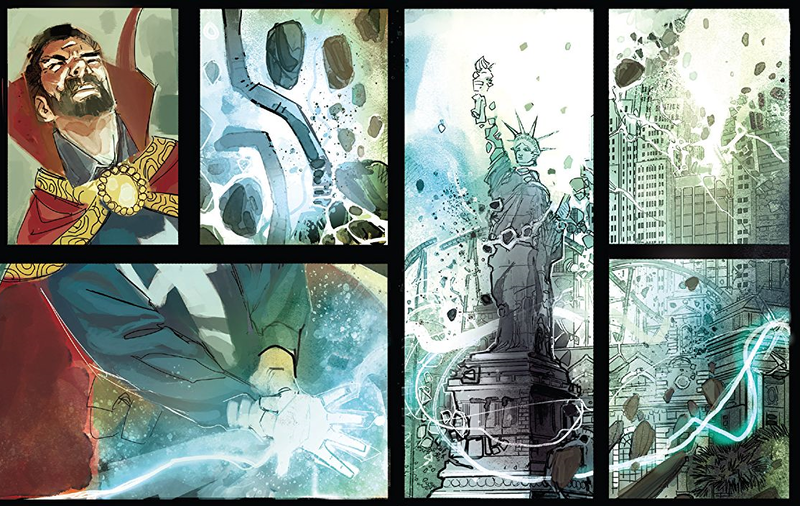 Doctor Strange: Damnation is a change of pace for the Complete Collection brand. Whereas the imprint has largely collected runs of the past, this is a collection of very recent material. Hopefully this means future runs and crossovers will be collected this way as well. The way that Damnation is assembled may initially cause confusion. The collection includes the main Doctor Strange: Damnation miniseries and the Ghost-Rider one-shot, along with the tie-ins from Doctor Strange, Iron Fist, and Ben Reilly: Scarlet Spider. However, rather than present them in chronological order, Doctor Strange: Damnation – The Complete Collection presents each tie-in in its entirety before moving onto the next, with the main series (and therefore the beginning and end of the story) at the beginning of the collection. If that seems baffling, simply read the collection in its arranged order. It becomes clear that the tie-ins, while adding substance to the choices of the characters, don’t quite fit with the pacing of the main story. Instead, they’re telling separate stories that … wait for it… tie in to the main narrative. For those who would prefer to read the story in chronological order, a handy chart is at the front of the collection, but speaking personally, I found the assembled reading order to have a better flow, even if the ending to the Ben Reilly: Scarlet Spider tie-in lacks the sense of closure that, say, the Doctor Strange portion of the book does. The material in the collection is all well crafted. Creators Nick Spencer, Donny Cates, Rod Reis, Szymon Kudranski, Dan Brown, Travis Lanham, Niko Henrichon, Laurent Grossat, Cory Petit, Christopher Sebela, Phil Noto, Ed Brisson, Damian Couceiro, Andy Troy, Peter David, Will Sliney, Rachelle Rosenberg, and Joe Caramagna all do a fantastic job with their pieces. The art styles vary between each miniseries, but there’s something for everyone to enjoy. The choice to have each miniseries isolated means that readers can appreciate each style without being visually bounced around between each issue. There are a lot of characters brought in to assist Doctor Strange in his fight against Mephisto and his Ghost Rider army and its fun to see these characters together again (and funny when the Avengers somehow take the credit for the victory). Mephisto works as a great antagonist for the Midnight Sons as he has personal connections and history with several members. Credit also has to go to the writers on the tie-ins for giving proper introductions to their respective leads. As an example, I have never read a Ben Reilly-led Spider-Man series. My knowledge of the character is less in-depth than his Wikipedia article. But in a single page, Peter David and Will Sliney give me enough to engage with him. I know he’s a guy who wears sweats to a hotel casino. Who says “Skedaddled” to himself. And I know he’s trying to rebuild his life. I’m in. Doctor Strange: Damnation – The Complete Collection is full of these small character moments that help flesh out the story, not just in the setup or emotional moments, but in the action sequences as well. The face-off between Johnny Blaze and Mephisto at the end of Damnation #3 is hilarious and heartbreaking at the same time. Doctor Strange: Damnation – The Complete Collection is a great collection of a very recent crossover that puts the reader in the deep end of Marvel’s magic realm without drowning them. While Doctor Strange gets top billing in the collection, plenty of other characters get to shine here, including those like Blade and Elsa Bloodstone who don’t have their own series. If there is one frustration, it’s that the collection doesn’t have much in the way of supplemental material. Interviews with the creators and editors as to how the crossover came about would have added a bit more value to the collection for those who have already bought the single issues. Doctor Strange, Wong, and the Midnight Sons face off against Mephisto in an exciting crossover that puts Marvel's supernatural heroes at the forefront. The story here works in a lot of personal stakes for its characters. The entire cast gets moments to shine. The tie-ins maintain the quality of storytelling, even if their focus isn't quite on the main narrative. The lack of supplementary material may hurt the value of the collection for those who already have the individual issues. While I personally like the assembled order of the collection, those who prefer to read everything in chronological order may find it to be a nuisance.